Ceased on July 16, 1909. Description based on: Vol. 36, no. 47 (June 24, 1892). The Nebraska Advertiser was founded in 1856 by Robert Wilkinson Furnas after recently settling in the Nebraska Territory town of Brownville. In 1859, Furnas also founded Nebraska Farmer, the first agricultural publication in Nebraska and one of its longest running journals. It is hard to overemphasize Furnas's importance to the state of Nebraska. He was elected to the Legislative Assembly of Nebraska Territory, served in the Civil War as a colonel in the territorial militia, was appointed an Indian Agent of the Omaha, Winnebago and Ponca tribes by President Abraham Lincoln, and was a member of the Board of Regents of the University of Nebraska. Furnas was elected the second Governor of the State of Nebraska on the Republican ticket and held the position from 1873 to 1875. Furnas was also the first president of the Nebraska State Historical Society in 1878-90. He remained active in civic affairs throughout his life, and started one or more short-lived newspapers in other parts of the state, including Beatrice in Gage County. Furnas' political stance was firmly Republican, being philosophically opposed to slavery and an admirer of President Abraham Lincoln. He had a feisty attitude toward Bourbon Democrats—members of the Democratic party that upheld ideals of conservativism and classical liberalism—and a profound love of orchards and fruit trees. Both the antipathy and the admiration are evident in most issues of the newspaper. In 1882, the Nebraska Advertiser became the Nemaha County Journal and Nebraska Advertiser. It was published in Auburn, Nebraska, which had become the county seat of Nemaha County. The subscription price was $1.00 per year. Later in the century, the title was changed back to Nebraska Advertiser and the paper moved to Nemaha City (also known simply as Nemaha). 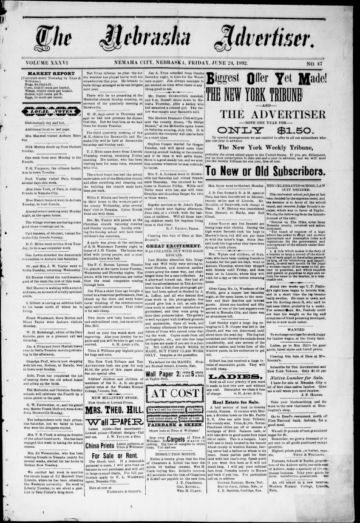 The Nebraska Advertiser ceased on July 16, 1909.